Here's another of my quick attempts at cell shading! 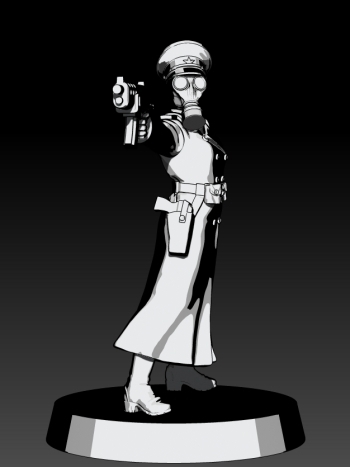 This is Commissar Vespera Venko, assigned to a Resistance cell to ensure their efforts further the aims of the ESU! She'll be a two-part casting with an optional gas-mask head. I hope to get these figures, along with a few bits and pieces, off for printing this week with the aim of getting them on sale late January/ early February. Great! 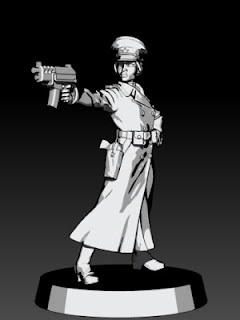 would it be possible an optional pistol in the hand, to make it even more diferent? I decided to keep the number of parts to a minimum so the pistol isn't separate; the pose doesn't really justify more separate parts. However, it would be a fairly straight forward conversion to use the Cell Officer weapon upgrade sprue to alter the weapon and pose.